This function is optional and is not active in the standard set of the server functions. You may need additional licensing to activate this function. When forming "live broadcasts", a few seconds delay is often used for quick prevention of bloopers or broadcast of other undesirable material. As a rule, the average delay time is 7 seconds - it's the standard value in broadcasting. This function even has the name Seven Second Delay, or Profanity Delay. The server software module Profanity Delay allows solving this problem by using the RAM of the server for recording/playout. Maximal delay time is 30 seconds, minimal time is 1 second. The input data is not compressed: it provides the original quality at the output of the system that works with SDI signals. Control of the delay modes is implemented from the server keyboard, or from the client station by the GPI commands, or from the external control panel. Simultaneous using a few delay modules allows the director to quickly switch the source (camera) and save the synchronism of broadcasting. During configuring the Profanity Delay module, you can set the type of emergency override: for video - "fuzzy" picture or playout of file, for audio - "tone" overlay, insert of "silence", playout of files. By the right click on the blue icon SL NEO in the taskbar, choose Stop Server and stop the server components. After some time the icon will change its color to red. 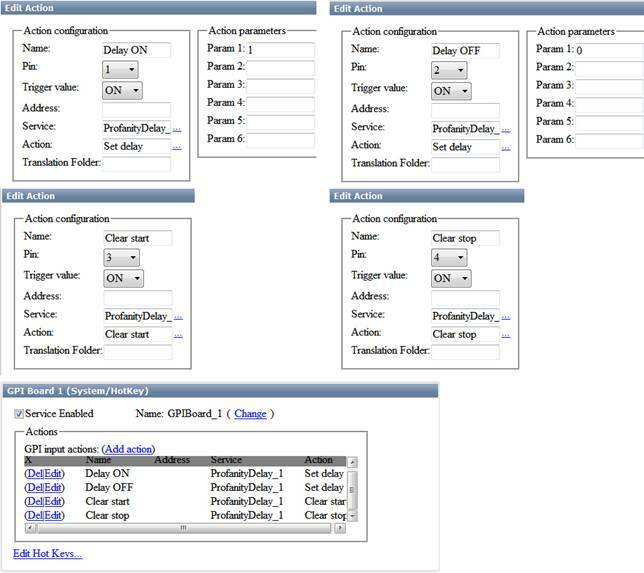 Right click on it and choose the item Configure Server Components. Find the field Available components in the setting window and add the element Profanity Delay to the right field. The module Profanity Delay is functioning jointly with the I/O devices: you should pay attention to presence of the appropriate I/O element of the server software in the system. For controlling the module Profanity Delay, it's recommended to add to the system the component System/HotKey that allows the user to organize control by using Hot Keys. See the details here. After the start of server software, further adjustments will be implemented from the Administrator Control Panel. Login to the console is implemented locally from the server, or from any machine in the network by the address http://ip address:7901. You should login to the control console as an administrator. After login to the console, choose Manage at the left menu, then find the item Profanity Delay and choose Service Enabled in the window Profanity Delay 1. Choose the needed TV format from the field Video Mode, set the number of audio channels in the field Audio Channels. Set the maximal delay time in seconds in the field Maximum Delay. The value Clear Step defines the time of the system’s reaction: after appearance of the undesirable fragment in the input signal, the operator should give the command for replacement. It will be implemented with some delay, depending on the reaction of the operator himself. The value Clear Step compensates the time of operator's reaction: the start of replacing the undesirable fragment in the delayed signal will begin earlier, per time set in the field Clear Step. File - setting the name of the file for replacement, entering the value in the format Filename.avi. The file should be previously uploaded to the server. Uploading the file to the SL NEO server is implemented directly from the control web-console. Choose the section Files in the console menu, then click Upload File and choose the file. The procedure of uploading is simple copying media-files without any conversions. After the file is loaded, it appears in the list at the page Files of the control panel. This technology allows uploading files from any remote machine to the server, with using a web-browser, and not using shared resources. Physical location of the uploaded file is the folder C:\Program Files (x86)\SL NEO Media Platform\run\files at the SL NEO server. Except this method, you can also copy the file to the folder by using Windows Explorer: after the end of copying, the file will also appear in the list of the console menu Files. Choose the section Manage from the left menu of the control console, find the item GPI Boards and choose Service Enabled in the window GPI Board 1. Choose the item Edit Hot Keys in the window GPI Board 1/System/HotKey. You should see a table in the opened window: the left part of the table contains the columns PIN - the identifiers of commands, the right part contains possible combinations of keys at the PC keyboard. Choose ... for editing and set the key combinations for PIN. For example, let's set the key F1 for PIN 1, the key F2 for PIN 2 etc (we shall need 4 keys). Configuring the module is finished, you should press Apply at the top part of the control console window, so the implemented changes could take effect. Choose Status in the main menu of the control console. This section displays the current status of configured modules of the server platform; switching streams to the modules inputs is implemented here. For switching the stream to the delay module input, choose the item Input in the appropriate icon Profanity Delay , select the type of source LIVE in the opened window, then find the field Source name and choose the capture service (for example, Capture_1). Use the same way for setting the stream from the output Profanity Delay to the input of the Playout service.